Now, it’s worth noting that the video was reportedly put up by Skype and then taken down (or made private) almost immediately. It was further reported that the video that we now see is actually a screen recording of the original. 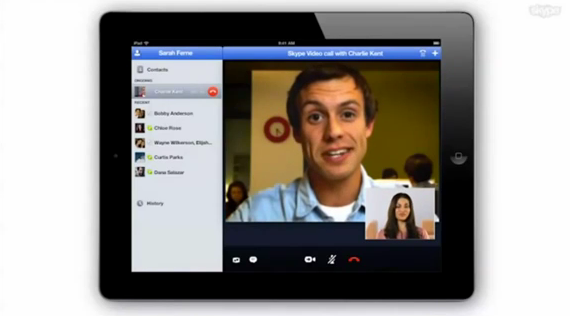 The other factor that makes me really second-guess the authenticity of this is that the demo looks much more fine-tuned than what we typically see out of Skype. Not to mention the fact that the Skype for Mac UI is so incredibly bad that it doesn’t seem to make much sense that the iPad version would actually look this good. Thoughts? Leave them in the comments. … the company is finally releasing an official version for the iPad. They haven’t announced a date for release yet, but video of the app has leaked out online, and the app is expected to be approved soon. Now, if you’ll pardon me, I’m off to sulk in a corner while @Zee gloats.